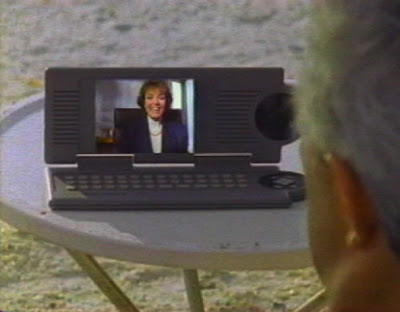 The Motorola concept video 2000 A.D. was produced in 1990 and focuses on the fantastic wireless future. Part one appears below. The video seems to cut off before the guy's wife divorces him for talking on the phone while on vacation. Remarkably accurate . . . only pitching the date a little earlier than it really turned out to be. I do find it disturbing, though, that the ability to bother people with work on their holidays is touted as a good thing. Not only that Matt but he seems to own his own private beach and seems strangely self-conscious when his phone goes off. Wonderful stuff. It actually took me a second to realize what was so futuristic about those phones - and then I remembered what my dad's mobile was like back in 92..